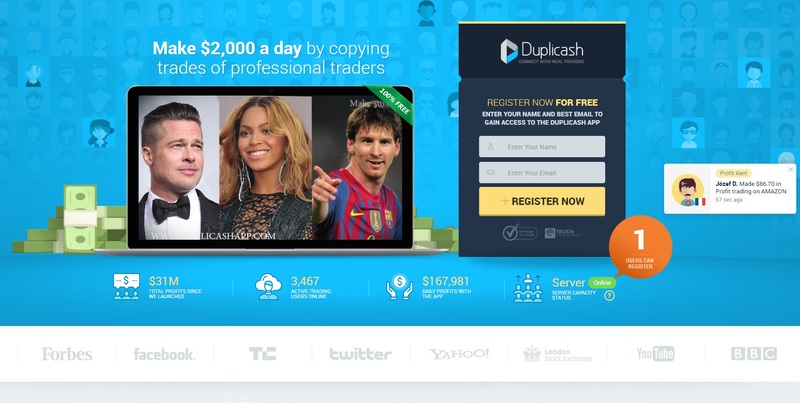 This Duplicash review explains why you should avoid this binary options trading platform. It is presented by Ed Mason. Duplicash allegedly is a social trading platform that allows you to copy trades of successful traders on you binary options account. It allegedly can make you $2,000 per day. Completely on autopilot, so you don’t have anything to learn. And Duplicash is of course free, because money is free, right? Do you sincerely believe that you can make $2,000 doing nothing, completely free? If so, you’d better change your mind. Let’s start with Mason. This guy is obviously a fictitious character. Because all the photos of him that he shows on his website belong to a model. In other words he is showing stock photos, so the man you see certainly is not a real binary options trader. This alone is enough to say that Duplicash is a scam, because Mason is lying about his identity. Duplicash also shows some endorsements from people who are allegedly making money with this program. But scams often use paid actors for fake testimonials and we have every reason to believe that Duplicash is the same. They made the video as small as possible to make it hard to identify the people, but we believe that we have find one of their actors that endorses their program. Look at the picture. All binary options scams push you to deposit money with a selected broker, because this is how scammers make money, they get affiliate commission from their partner broker for referring new depositors. And you guessed it, Duplicash does the same, it pushes you to first deposit money. In other words the program is not free, you won’t be allowed to use it until you deposit. They first need to earn their commission on you, only then they will let you see how their software works, or rather doesn’t. We are absolutely convinced that it is losing money. Duplicash is a scam that will push you to let a dubious software trade with your money, no testing is allowed. Stay away from it! You should always start on a demo account with binary options, it is the place to learn how to trade profitable and to verify a strategy or system that you want to try. If you are not allowed to verify the system on an independent demo with a regulated broker, stay away from it.